Interested in finding out more about Hawken or attending one of our events? Click "Inquire or RSVP" to create an online account, RSVP to events, and receive reminders of events, deadlines, and news from the school. Applications for the 2019-2020 school year are currently being considered on a rolling admission basis. Before beginning an application, please call 440-423-2950 (Toddler - Grade 8) or 440-423-2955 (Grades 9-12) to inquire about space availability. Applications for the 2020-2021 school year will open in September and are due in January of 2020. 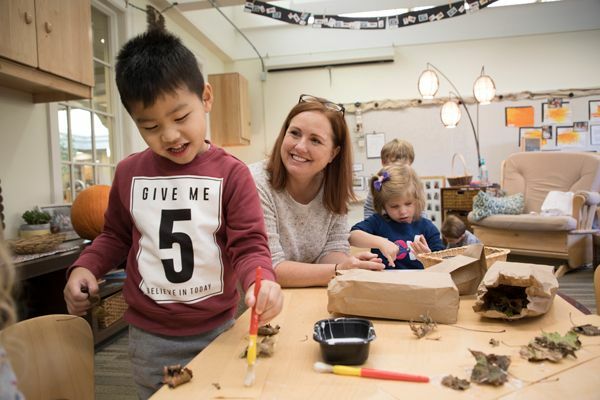 We are delighted that you are interested in learning more about Hawken School, a coeducational day school that offers a challenging, real-world education for students from preschool through grade 12. Academically progressive with a dual focus on character and intellect, Hawken was founded to be different - because that’s what it takes to prepare students to thrive in a changing world. From becoming co-educational in 1973 to designing innovative schedules, programs, and learning spaces that support learning by doing, Hawken boldly adapts to and reflects the values of the present to prepare students for a promising future. While you’ll find an abundance of information on our website, the best way to get to know Hawken is to visit. With over $8.9 million in tuition assistance each year, we welcome students and families from all backgrounds to tour our campuses, explore our state-of-the-art facilities, and learn about our innovative, nationally recognized programming. To sign up for a group event, individual tour, or visit day please call 440-423-2950 (grades preschool-8), or 440-423-2955 (grades 9-12) or click here to inquire online. Hawken offers a variety of ways to help parents make the important decision of where and how to educate their children. One of the best ways is to visit. Parents can see school in session during one of our weekday Parent Visits. Families meet faculty and tour facilities at an Open House. Families can schedule a personal tour or meeting with a member of our admission team. Students attend classes during their visit day as part of the application process. Individual campus tours and student visit days may be scheduled by contacting the Admission Office at 440-423-2950 (Lyndhurst Campus) or 440-423-2955 (Gates Mills Campus). RSVP now for one of our events by clicking here. For directions to our Lyndhurst and Gates Mills campuses, please click here. Acceptance to Hawken is dependent on two factors: applicant qualifications and availability of space. Because spaces are limited and the applicant pool is competitive, it is to the candidate’s advantage to complete their application by the admission deadlines listed below. Applications completed after these deadlines will be considered on a rolling admission process based upon space availability. Hawkens's application process is thoughtfully designed to allow us to get to know your child and your family. The Student Exploration Visit gives children an opportunity to explore our Early Childhood Center, The Nido. Not only will students enjoy navigating the many areas of the Nido designed specifically for young children, but this visit will also allow you to envision your child in the Hawken environment. Prekindergarten and kindergarten candidates will also participate in a brief activity during the one-on-one visit as part of the admission process. Please call our Lower School Admission Office at 440-423-2950 to schedule Student Exploration Visits. Schedule your child's Discovery Group visit through your secure online Ravenna account. Please call the Lower and Middle School Admission Office at 440-423-2950 to schedule a shadow day for your child. Students will visit classes for a full day and tour the campus. Both a math and reading assessment will be administered during the individual visit day. Parents of all applicants are also highly encouraged to take a campus tour and to meet with a member of the admission staff. Please call the Admission Office at 440-423-2950 to schedule a shadow day for your child. Students will visit classes and tour the campus on this day. Parents are also highly encouraged to take a campus tour and to meet with a member of the admission staff. Please call the Upper School Admission Office at 440-423-2955 to schedule a personal visit day. Students will visit classes, tour the campus and have an interview. Parents are highly encouraged to take a campus tour and to meet with a member of the admission staff. If the applicant would like to meet with a particular coach or instructor, please inform the Admission Office when arranging the visit day. Teacher Observation Form: If you child is currently enrolled in a school or daycare program, use the prompt in the online application to send his/her current teacher a link to complete the Teacher Observation Form. Once the teacher has completed this information, it will be sent to us directly. This form is required for any student currently enrolled in a program. If your child is not currently nor has ever attended a program, please bypass this step in the application. Personal Recommendation: An optional Personal Recommendation may also be submitted by an adult who knows your child well such as a music or art instructor, in-home caregiver, clergy member or neighbor. English and Math Evaluations: Delegate the Teacher Evaluation forms to the current English and math teachers from the online application using teacher email addresses. Teachers will complete and submit the evaluations online. School Administrator or Guidance Counselor Evaluation: Delegate the evaluation to the appropriate Principal, Guidance Counselor, or school administrator. The administrator will complete and submit the evaluation online. Optional Personal Recommendation: Delegate the optional personal recommendation to a non-family member who knows the applicant well, such as a coach, clergy member, scout leader, music or art instructor, or an additional teacher. The recommendation will be submitted online. Applicants to Grades 1-12 print and sign the School Records Release form through the online application and take to their current school. Schools submit the requested records directly to the Hawken School Admission Office. Hawken requires transcripts and/or report cards from the 2018-19 school year (through the most recent marking period) and the complete 2017-18 academic year. Early childhood applicants are evaluated as part of the Student Exploration Visit and the Student Discovery Group described in Step 2. For applicants to Grades 1-4, a math and reading assessment will be administered during the applicant’s Shadow Day. For students entering 11th and 12th grades, submission of PSAT, SAT I, or ACT scores is acceptable for exams taken within the last year. When should we schedule a visit to campus? Students applying to Hawken spend a day in our community. These visits may be scheduled beginning in September and must be completed before the application deadline. The admission process for applicants begins the year prior to desired entry, keeping in mind Hawken’s application deadlines listed above. Applications received after the stated admission deadlines will be considered on a rolling admission basis as they become complete and will be subject to space availability. Is there an age requirement for Preschool, Prekindergarten and Kindergarten applicants? Preschool students must turn three by December 31 of the school year they enter Hawken. Any students turning three between October 1 and December 31 will spent a second year in Preschool before enrolling in Prekindergarten. Prekindergarten students must turn four by September 30th. Kindergarten must turn five by September 30th. All enrolled students must be able to use restroom facilities independently. What criteria are used for admission decisions? Admission to Hawken is competitive and is based upon the strength of a student’s application as well as space availability. Each applicant’s file will be reviewed by an admission committee consisting of faculty and administrators in the division to which the student is applying. The committee considers each applicant’s promise of academic success at Hawken and alignment with Hawken’s Purpose Promise and Principles. When are families notified of admission decisions? Please refer to Hawken’s application timeline above for further details. Typically, families will have two weeks from the time admission decisions are given to notify Hawken of their intent to enroll. Does Hawken School accept international students? Hawken is able to accept international students. However, Hawken does not have a residential program and enrolled students must live with an adult family member who will act as their guardian while in the United States. Hawken does not offer an ESL/ELL program and students should be fluent in written and spoken English. We require the ISEE (or SSAT) and the TOEFL as part of the application process. In addition, applicants must complete an interview, either via Skype, or during an on-campus visit day. If a student is accepted and enrolls, Hawken will issue an I-20 Form. Hawken transports approximately 25 percent of our students each year. Our transportation program meets all state requirements and inspections regarding the approval of bus drivers, standards for buses, and safe speeds. There are three choices of transportation services for students. Click here to learn more about transportation at Hawken.